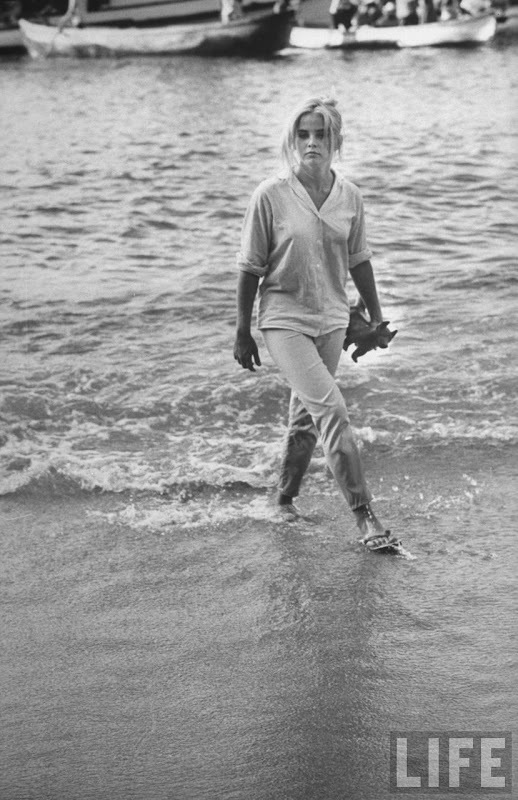 Photo of actress Sue Lyon walking on beach on location during the filming of The Night of the Iguana by Gjon Mili, 1963. My dad walked on this beach once. His memory of it is not so idyllic as this photo: covered in sand flea bites, he had to visit a local pharmacy. I've been a longtime reader of your blog--one of my favorites and I always look forward to new posts :) I have a bit of a request-- I'll be attending a wedding in january and have decided to ditch the typical dress and heels route and go full throttle tomboy. I have a black tailored blazor and a white button down but have had trouble finding the perfect trousers. Do you have any favorites? If you do, I'd love to see a post! I'm trying to track down something modern (think mid-high waist and slim leg) a la Janie Cai. @Ashley: That's a good question, but I think it all depends on the tailoring and your body type (and your budget). The advice I can give is: wear a cummerbund instead of a belt. It's a fun way to dress up the outfit and it's unexpected. I'd also explore some patterned silk scarves or big chunky jewelry for your neckline to add a festive element.